Transporting guests to offsite locations can only be effective if guests give you enough time to get them to their destination. This issue is most important at hotels taking travelers to the airport, where guests need to be conscious of flight times and potential delays. In hotels where this is pertinent, companies such as Flyte Systems, a provider of digital signage that tracks the status of airline arrivals and departures, can be of assistance, in particular for hotels that are frequented by flight crews. These crews run on a tight schedule that relies on strict travel times, and ensuring they are aware of where they need to be at all times can keep hotels out of hot water. 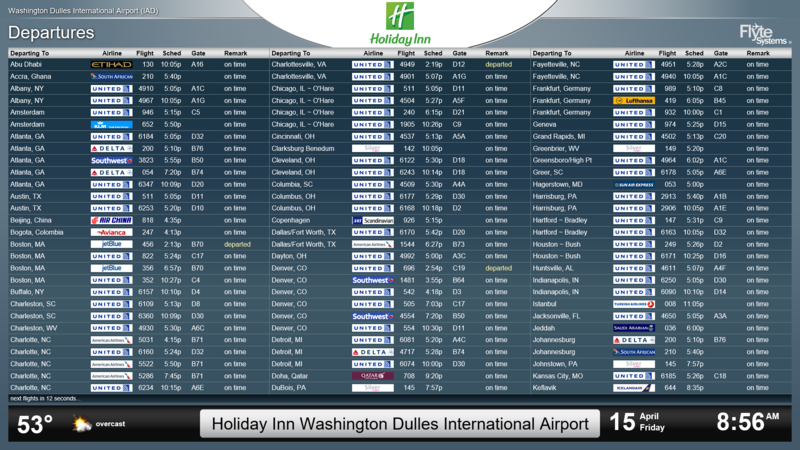 The lobby is the most common area for digital displays, especially those for public information such as airline schedules, but having another option for tracking flight news in the back of house can also be helpful. 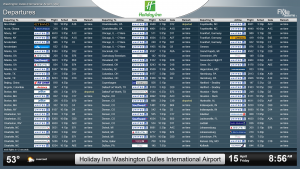 Bob Janis, GM at the Holiday Inn Washington-Dulles, said his hotel uses a web application to track arrivals to streamline transportation scheduling apart from regular runs to the airport. Another way to make sure guests are aware of their travel times is to display flight information in guestrooms. Article by Elliott Mest. Featured in Hotel Management Magazine.